Café mayB will be host to the Cypher Jeju 1 spoken word poetry event Jan. 15, 2017. Presented in part by Angle Magazine, this evening of poetic power has high hopes of becoming the first of many such events on the island. 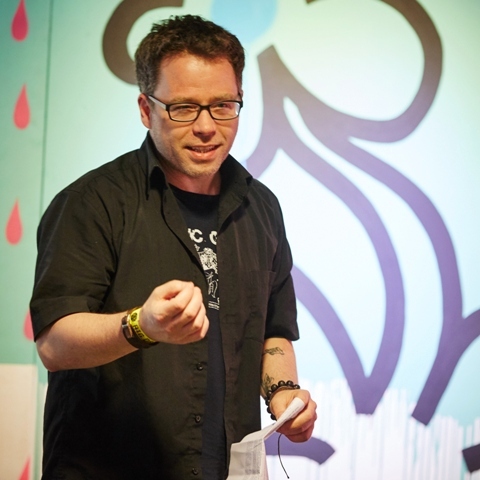 Long time poet and performer Sean O’Gorman will be flying in from Ulsan to share his work as well as to enjoy what the local crowd has to offer. 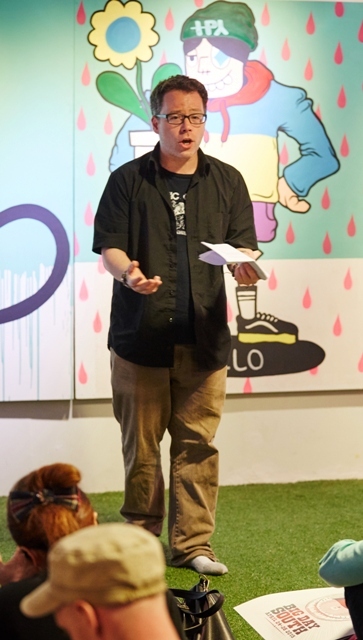 Sean is the founder and organizer of Ulsan’s monthly poetry event and I was lucky enough to have a sit-down with him to get a brief primer on what we might be in for. Billiams: What can I expect out of a poetry night? Will it sort of be like an emcee battle? Something with a lot of snapping? Or should I just stay quiet until the author tells me it’s okay to clap? Sean: What Cypher offers is not a battle, but more a space that allows writers to share their work individually. There is more of a variety of styles that can be heard on any given night. That being said, that doesn’t mean that the crowd needs to be sitting in silence the entire time. There are some scenes that do require silence from the audience, but spoken word events certainly do not. One of my favourite things about this art form is that there is a connection between artist and audience. We encourage people to let loose a little while in the moment. If they hear something that personally speaks to them, they’re encouraged to let the artist know. Some people choose to snap their fingers, others speak out in the moment. The connection that this creates is an amazing experience. Billiams: If I were going to write something or read something at this event, what kind of piece should I prepare? Sean: I always tell people who are starting out to work from the inside. If you truly want to find your voice and share it publicly, then write something that only you can write. It can be a topic that has been touched on before, but put your own twist on it. You are the narrator writing from your own perspective. Never try to speak for another person, or group of people. This is an art form that requires people to face themselves, in a way. Every life comes with positives and negatives. Start by finding a topic that genuinely motivates you to speak up. It could be something that you are currently experiencing, or maybe something from your past. Poetry is therapy. The best advice I have ever received on writing spoken word was to write the poem that I was afraid to write. Billiams: I write a little bit myself. To be honest, I kind of get excited when I think about reading in front of people, but it seems so nerve wracking. Can you talk to me a little bit about that feeling? Sean: I absolutely understand the feeling. When I went to my first slam I was hooked and at that time there were two monthly slams in my city. I rarely missed one, but the fear took a while to control. It never really dies, however facing the fear of not only public speaking, but sharing something so personal - it’s an incredible experience. My advice is to simply jump into it. It’s a lot of fun to memorize the poem first. In my opinion it’s much more interactive when you aren’t holding a phone, or a piece of paper. But that creates some issues with being distracted while sharing the poem, and you can easily just forget the second half of the piece. My main rule for myself is to find an object near the back of the audience to focus my eyesight on. Mainly ‘cause making eye contact used to throw me off. For those who plan on reading off paper, print it with at least 14 point font. My hands used to shake like crazy and that made reading the printed version of the poem quite difficult at times. A larger font size will help. Billiams: What’s the point of doing things like this? Have you seen anything special come out of these types of shows in Korea? Sean: Spoken word scenes back home, and here in Korea, are not without their problems. To be fair they are rarely without issues, but when you weigh out the good and the bad, I always come to the same conclusion: the communities that these events create are truly incredible. The feeling that you get when you are a part of something where the people are all passionate about art and sharing - it’s not the easiest thing to describe. On an individual level, these places help people find their voice and that can change their lives. Not only that, the opportunities that have surfaced for me through this art form have been wonderful. Especially living in a foreign place. Having the chance to meet other like-minded people from all over the world is an incredible opportunity. Billiams: What are some of your favorite things to see on nights like this? Sean: My favourite thing will always be those who sign up for the first time. I think it’s because I understand the leap it takes to do so. First-timers often leave the stage with a noticeable high and being there to see it is always a nice experience for me. Billiams: Last question - do you have any words for us as we prepare ourselves? Sean: I would just say to come with an open mind and bring something to share on the open mic.